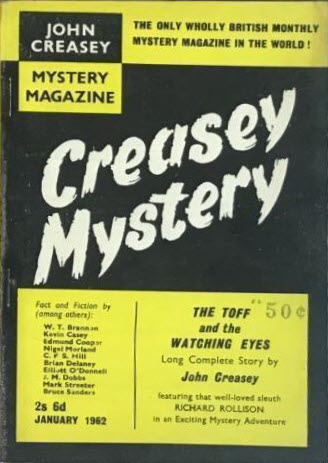 This is the first issue where the cover also reads John Creasey Mystery Magazine. 90 · Holiday at Home [The Courts Day by Day] · J. A. J. · ts The (London) Evening News 19?? 86 · Looks at New Books · Leo Harris · br Books and Bookmen 19?? 89 · The Face That Launched a Thousand...Asterisks [The Courts Day by Day] · J. A. J. · ts The (London) Evening News 19?? 54 · All Was Clear...But Not for Grace [The Courts Day by Day] · J. A. J. · ts The (London) Evening News 19?? 113 · Goodbye, Seaside... [The Courts Day by Day] · J. A. J. · ts The (London) Evening News 19?? 116 · Two Serpents from One Egg [Did It Happen?] · Elspeth Huxley · ts The Evening Standard 195? 40 · Respect Can Be Taken Too Far! [The Courts Day by Day] · J. A. J. · ts The (London) Evening News 19?? 76 · Ships Cook Stirs It Up [The Courts Day by Day] · J. A. J. · ts The (London) Evening News 19?? 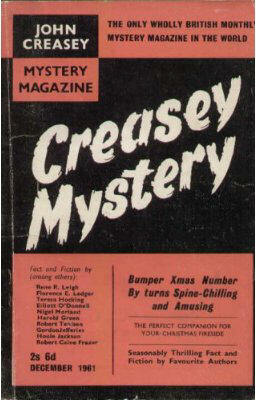 36 · A Writer Looks at Life: The Art of Research · John Creasey · ar John o Londons Weekly 19?? 86 · All-Sorts Day at Bow Street [The Courts Day by Day] · J. A. J. · ts The (London) Evening News 19?? 41 · This Wifes Home Is Her Castle [The Courts Day by Day] · J. A. J. · ts The (London) Evening News 19?? 63 · Angel in Pink Trousers [The Courts Day by Day] · J. A. J. · ts The (London) Evening News 19?? 30 · Midnight Burial · C. F. S. Hill · ss Suspense (UK) Feb 1961; given as by C.F.F. Hill in the Table of Contents. 51 · Bank Clerk Behind Bars [The Courts Day by Day] · J. A. J. · ts The (London) Evening News 19?? 48 · Young Romeo Was Crossed in Love [The Courts Day by Day] · J. A. J. · ts The (London) Evening News 19?? 65 · Such a Jolly Evening [The Courts Day by Day] · J. A. J. · ts The (London) Evening News 19?? Mystery of an Old School Tie [The Courts Day by Day] · J. A. J. · ts The (London) Evening News 19? ?